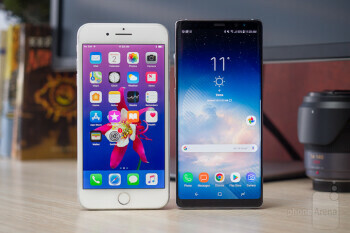 When it comes to rivalries in the tech industry, few are the clashes more fierce than the one between Apple and Samsung for dominance on the smartphone arena. Over the past few years, Samsung has stepped up its design efforts and now makes beautiful glass and metal devices that catch the eye. 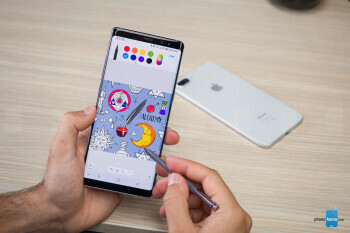 The latest is the Samsung Galaxy Note 8: a big _phone_ paired with an S Pen stylus, which is a unique feature that no other _phone_ on the market can deliver. But the Note 8 may have just met its match. Apple just launched its new iPhone 8 Plus, introducing an evolutionary design with a glass back, a hugely improved processor and new iOS 11 chops. Both phones are also powerful cameraphones: the Note 8 is Samsung’s first phone with a telephoto lens intended for zooming and portraits, while the iPhone 8 Plus further improves the Portrait Mode Apple introduced last year with the 7 Plus. 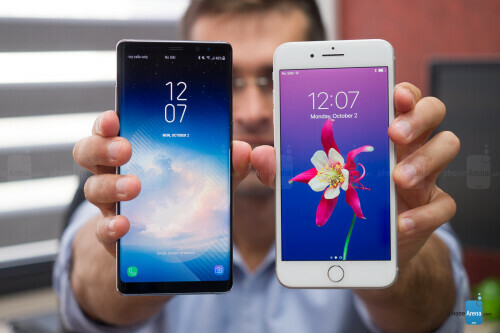 Both are big phones, but the bezel-less Note 8 makes better use of that space with its Infinity Display. 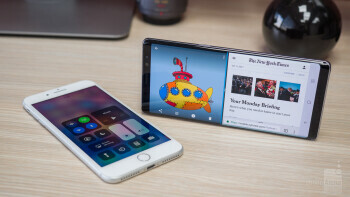 Samsung has done a great job going from cheap and uninspiring plastic phones a few years ago to its industry-leading sleek glass-and-metal designs, while Apple… well, let’s just say that the iPhone 8 Plus feels like the fourth generation of the same design the company introduced with iPhone 6 Plus. It’s not changed much. And this feels like one area where Samsung has taken the lead: it has the futuristic bezel-less design and it has the sleek look, while the iPhone 8 Plus feels like... more of the same. But it has evolved: the new glass back on the iPhone 8 Plus does make the phone feel better in the hand, and the silver and gold colors mask fingerprints very well, so the phone looks clean even after it has been used for a while. Notably, the space gray iPhone, just like all versions of the Note 8, gets messy with finger smudges very easily. There are two other important things about the glass design on both: one, it can scratch easily, and two, it will likely break if you drop it. Cases are certainly recommended with both the Plus and the Note 8, but if you dare use the phones without one, you would notice that unlike other metal phones (cough, matte iPhone 7), these two are not that slippery, which is good. 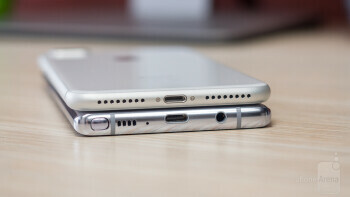 The other thing to know is that both these phones are big, really big. Neither phone fits comfortably in my jeans pocket. The Note 8 is narrower, but longer, while the iPhone 8 Plus is very wide. You have to use both of your hands most of the times when using either of these phones. Considering they are so big, it is really annoying that Samsung continues to place the fingerprint scanner way out of reach and near the camera on the Note 8. It’s a big inconvenience, and the front-placed iPhone 8 Plus finger scanner feels much more natural. Both are rather weighty, but not too much and we do like that solid feeling in the hand. The iPhone 8 Plus is the slightly heavier of the two: it tips the scales at 202 grams (7.13 ounces), while the Note 8 weighs 195 g (6.88 oz). Both phones are water-sealed (hooray! 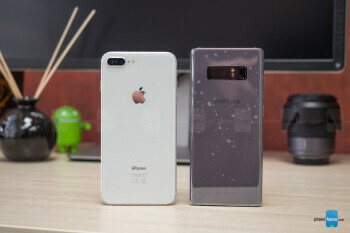 ): the iPhone carries an IP67 rating, while the Note 8 has a higher, IP68 certification. 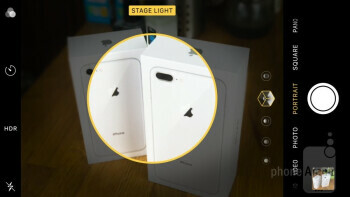 The first ‘6’ in both ratings signifies that the phones are equally well protected from dust ingress, while the second figure differs: the IP67 iPhone can withstand immersion in up to 3-feet deep water, while the IP68 Note 8 can withstand up to 5-feet water depth, and both are guaranteed to withstand water damage within 30 minutes. Two of the best screens out there: lively colors, excellent brightness. Let’s get this out of the way: these are the two best looking screens on the market right now. The iPhone 8 Plus has a 5.5-inch LCD, while the Note 8 features a 6.3-inch AMOLED display. Both default to 1080p resolution, but you can set a higher, Quad HD resolution on the Note 8. 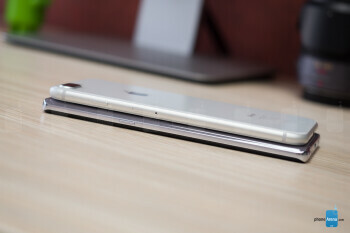 The big difference is in the sheer size and form of the screen. Samsung calls its screen “Infinity Display” because it has almost no bezels, and this shows in our measurements: the iPhone has a 67.5% screen-to-body ratio, while the Note 8 rocks 83%. This makes a difference: the Note 8 feels more immersive, more impressive, and it fits more content. Admittedly, the bottom part is still occupied by virtual buttons, so you don’t always have the full screen unobstructed. Then we have color, the bread and butter of all displays. The iPhone 8 Plus supports DCI-P3, a color standard that simply means that the phone can show more colors. It’s especially noticeable when you compare this to a traditional screen, where colors look duller, less vibrant. The Note 8 also supports eye-popping colors by default, and you can select different color rendition modes for the Note in settings. Then, the iPhone 8 Plus comes with one neat innovation: True Tone technology. True Tone will adapt the display’s white balance to room light, usually making your phone look slightly warmer indoors, for a more natural look. We like this small convenience. The Note 8, on the other hand, gets slightly brighter outdoors, but both have among the highest screen brightness ever and low reflectivity and are easy to use outdoors. Finally, if you are a night owl, you should know that the Note 8 is more comfortable to use at night time with its lower minimum brightness that will induce less eye strain. Over the past few years, Samsung has stepped up its design efforts and now makes beautiful glass and metal devices that catch the eye. The latest is the Samsung Galaxy Note 8: a big phone paired with an S Pen stylus, which is a unique feature that no other phone on the market can deliver. iOS 11 excels with apps and features: ARKit is fun and iMessage is addictive. Android on the Note 8 handles notifications, multitasking and sharing better. 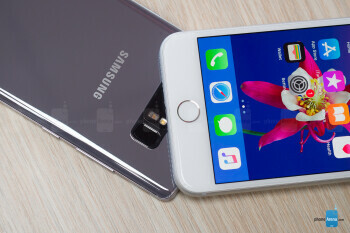 iOS on the iPhone and Android on the Samsung are two fundamentally different platforms that do mostly the same things, but in different ways. On the iPhone 8 Plus, we have iOS 11 out of the box, while on the Galaxy Note 8 we find Android 7.1 with the Samsung Experience skin. 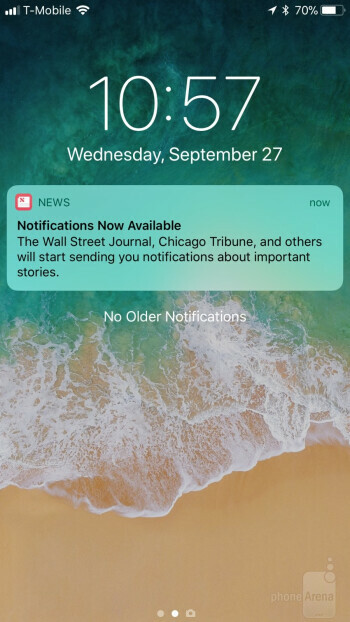 On a fundamental level, iOS looks better and runs smoother, but Android handles notifications in a much more organized way. Let’s start with the key advantages of the iPhone 8 Plus and iOS 11. First and foremost, iMessage! The instant messaging service is used by the great majority of iPhone owners in the United States (but not so much outside the US). Since it does not run on Android, it is one key feature that is keeping people in the Apple camp. Then the new iPhone does Augmented Reality with Apple’s ARKit. ARKit is a lot of fun: the first apps supporting it are out and they include a stargazing app, an IKEA furniture fitting app, some games and an innovative and accurate way to measure things using just your phone. Android is playing catch-up here. The App Store is another key advantage: it has apps that are better optimized and games of higher quality arrive there earlier and often exclusively. 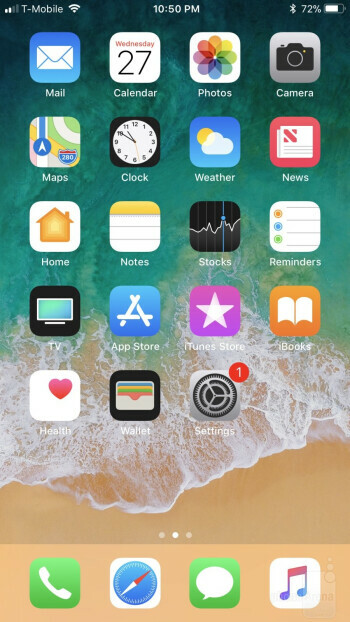 iOS 11 is visually refined, scales better and features well-balanced fonts and looks. 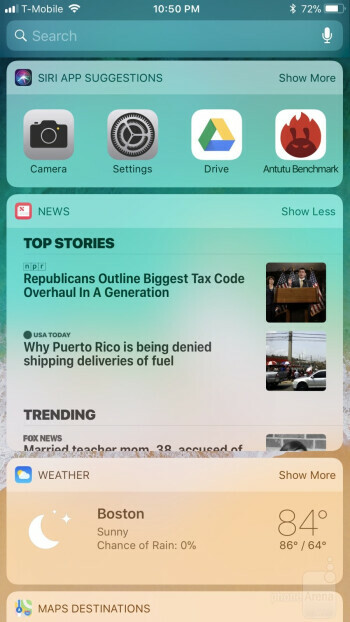 You also have features like 3D Touch as well as annotated screenshots. What about the Note 8 and its interface? Android excels in customization with themes and icon packs, things that you simply cannot alter on the iPhone. You also have split-screen multitasking – another power-user feature iOS doesn't offer yet. On the Note 8, Samsung lets you save your own app pair presets, which is a nice little convenience if you often find yourself using the same apps in split screen. 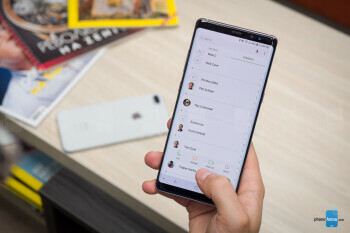 You also have the Edge feature: a tiny panel on the side that allows you to get shortcuts, your favorite contacts, weather and stock information right away from any place in the phone. The Note 8 also supports an Iris Scanner to securely unlock your phone, and it works fine when the phone is not too far away from your face, but it’s not as reliable as the fingerprint scanner on the iPhone 8 Plus. There is another cool feature the Note 8 supports: DeX. 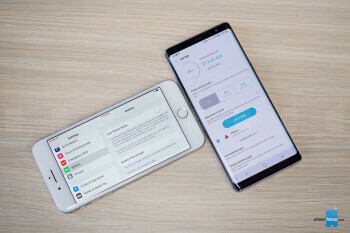 Place your Note 8 on a tiny dock, connect it to a large-screen monitor and it will work a lot like a desktop computer, allowing you to do work the big screen. While Samsung’s PC dock solution is not perfect, it’s still good for doing text work, browsing or going through your photos or videos. There is one looming battle in the smartphone space: that of voice assistants. On the iPhone you have Apple’s Siri, while on Android – somewhat typical for its fragmentation – you get both Samsung’s new Bixby and the Google Assistant. Siri has one key advantage over any of the two assistants on the Note 8: you can use it straight from the lockscreen, without needing to unlock your phone to quickly set an alarm, add a reminder, a calendar event or what not, and this definitely gives it a speed advantage. But the Google Assistant understands what you say better, understands context better and can just do a bit more. Samsung’s Bixby is the strangest of the bunch. It has one super-power: it can do things inside apps that the other two cannot. But it requires exact phrasing, it does not understand voices as well as the other two, and would need more work to get at the level of Siri and the Google Assistant. The Note 8 has one other unique feature among all other phones: the S Pen. The S Pen is a key advantage that the iPhone cannot match in any way. Not everyone needs pen input on their phones, but for those who do, the Note 8 will be a very enjoyable experience. You can just take off the S Pen and write on the screen right away, a feature called off-screen memos. You can also do things with greater accuracy: photo editing and others. The S Pen is a great tool for artists and creators, those who like to draw and sketch. All of those functionalities the iPhone cannot fully match. The iPhone 8 Plus’ A11 Bionic is significantly faster than the Note 8’s Snapdragon 835, but that does not matter much. 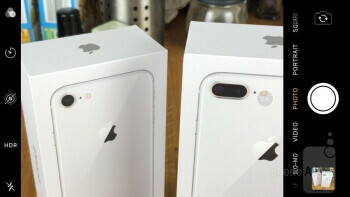 These are two of the fastest phone on the market, but in 2017 this really does not mean all that much in terms of practical advantages. The iPhone 8 Plus has the Apple A11 Bionic chip, while the Note 8 features the Qualcomm Snapdragon 835, and both are build on 10nm manufacturing for better power efficiency. The A11 Bionic is a hexa-core design with two big CPU cores and four smaller ones, while the Snapdragon 835 has octa-core design with four big and four smaller cores. There is also 3GB of RAM on the iPhone and 6GB RAM on the Note 8, but you have to consider iOS 11 optimization and difference in platforms. The A11 benchmarks blow anything else out of the water, including the Snapdragon 835. The chip even matches Intel Core i-series chips in short-term performance! It beats laptops like the Macbook Pro! But here is the thing: the iPhone 8 does NOT feel faster than the Galaxy Note 8. Smoother? Yes, the Galaxy Note 8 hickups sometimes, but despite that, it does not feel slower at opening apps in the daily grind. 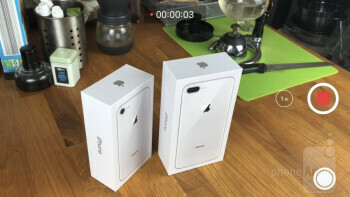 Where the iPhone 8 excels is truly demanding tasks: you can load up a 4K video project in iMovie and see that it renders multiple times faster than on the Note 8, but this is not your usual daily use. For most users, this huge advance in power would be a reserve for the future, but not an immediate advantage in the present. For gamers, the iPhone is the better phone than the Note by a long shot. And yes, it is because of its faster performance, but mostly because of the App Store: the fact is that the best games arrive first and often exclusively for iOS. 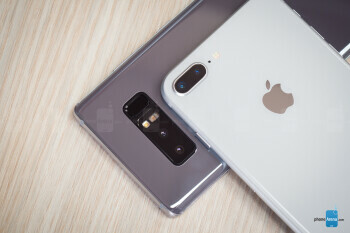 In terms of storage, the iPhone comes in two versions: 64GB and 256GB with no memory expansion option, while the Note 8 ships with 64GB of native storage, but it has a microSD card for expandable storage. The iPhone 8 Plus has breath-taking colors, while the Note 8 is a close runner-up with excellent sharpness. Not only are these two of the best smartphones all around, both of them aim for the best phone camera title as well. 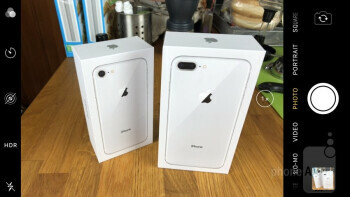 Both have a dual camera system on their backs, both have a telephoto lens to zoom in, and both support portrait mode to blur the background. So let’s skip the specs and go straight to what matters: the actual performance. The cameras on both open similarly quickly and snapping pictures is very fast on both. First thing you notice when you compare photos from the two is the difference in colors. The iPhone has more realistic colors while the Galaxy has slightly more vibrancy to them. 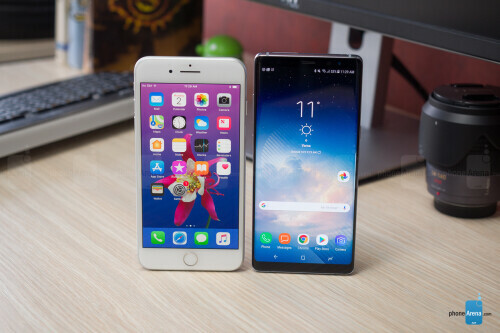 Both look great and it’s a matter of personal preference which one you like better, in some cases the iPhone has the slightly better look, in others – it’s the Note. One peculiarity with the Note is that it always renders greens with a slight yellow tint, this is an easy way to tell the pictures apart between the two. The Note wins it in terms of sharpness: pictures on it clearly have more definition and have a more eye-popping look. Looking at the details, you notice that the iPhone lacks sharpness around the edges of a picture, while sharpness on the Note stays consistent in the whole frame. Is there a clear winner? We tend to like the Note 8 look a bit more, but stripping personal preference aside, a draw is a fair outcome. The thing that you probably are really curious about is Portrait Mode, the feature that blurs the background of an image leaving only the person in sharp focus. On the Note 8, this is called Live Focus because you can actually adjust the amount of blur added to the frame, while on the iPhone it is pre-set to a certain level. The big problem with blurring the background on images is in those tricky edges where you have to draw the distinction between subject and background. The Note 8 does a slightly better job making it a more invisible transition – at least in the set of samples we took for this comparison – while the iPhone preserves a bit more artifacts. Oddly, the Note 8 did worse than the iPhone in a recent Portrait Mode comparison of ours, so the results could greatly depend on the shooting circumstances. And then we have sharpness: the Note 8 consistently takes sharper, more pleasing pictures, while the iPhone has lackluster detail in comparison. The dynamic range of the Note 8 is also better: the iPhone burns the highlights easily, while the Note 8 is able to preserve more nuance in pictures. It adds an extra pop to faces in portraits and it’s seamlessly integrated in the camera and photos apps, but it’s hard to see it as more than just a few additional (good-looking) filters. You can see more about it in our detailed Portrait Lighting article here. 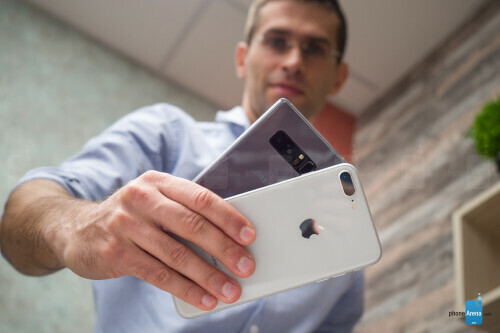 One area where the iPhone has an advantage is certainly video: it supports 4K at 60fps, which is a big leap in terms of quality, especially when there is any kind of motion in the shots. It makes a big difference and once you see how smooth 4K at 60fps looks, you will not want to go back to 30fps. But it comes at a cost: double the storage size. So if you are planning on recording a lot of video in 4K at 60fps, you’d better get ready to spend extra for that 256GB iPhone model. Samsung has promised to update the Note 8 to support 4K at 60fps in the near future, but we don’t have that update yet. But even in 4K at 30fps we can see that the Note 8 has a slightly less dynamic video capture and video stabilization with OIS looks more jittery on the main, wide-angle camera. Switch to the tele lens in video, though, and the iPhone 8 Plus can’t match up: it lacks OIS and footage looks very shaky, while the Note 8 stabilizes the secondary tele lens as well. 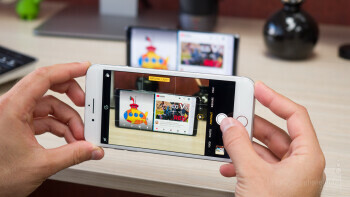 iPhone now uses modern HEIF and HEVC formats for photos and videos. These new formats can half the size of photos and videos, and make great use of limited on-device space. 1 minute of 4K 30fps video now takes up 170MB, while it used to occupy 350MB of space. Keep in mind that many other platforms will not recognize and play these newer formats, but unless you directly try to download these files, sharing them will automatically convert them to compatible legacy formats. The Note 8 uses the standard JPEG and MP4 file formats that take up more space, but are easily recognizable across all platforms. There is a single bottom firing loudspeaker on the Note 8 and while it gets pretty loud, it lags behind in comparison to the clear, crisp, well pronounced sound from the iPhone 8 Plus. The Note 8 is muddy and lacks definition sorely, so if you listen to music straight from your phone speakers, the iPhone provides a much better experience. Of course, using headphones results in much higher quality of the audio, but there is no audio jack on the iPhone 8 Plus. Yes, it’s been a year, and no, the Lightning ecosystem of headphones has not really exploded with options. You do have the excellent AirPods, though, and we recommend using them. Dealing with the unsightly Lighting to 3.5mm adapter is really not something that we are looking forward to, but you should know that the adapter does come included in the box. It’s all easier on the Note 8 where the good old 3.5mm jack is present. We’ve had no issues with call quality on the iPhone 8 Plus and Note 8 we’ve had for this test. Some early users are reporting hearing a lot of static noise on iPhone 8s (and our other review unit also suffers from such problems), and that’s an issue that Apple has admitted exists. 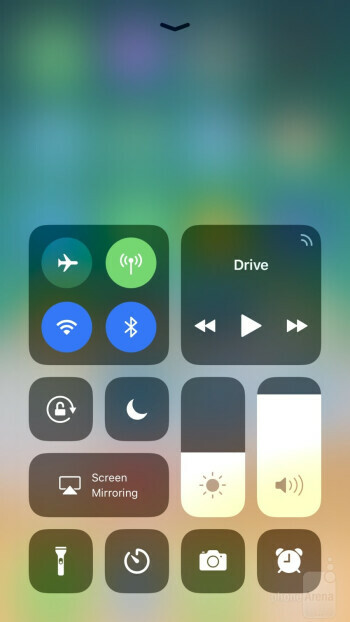 A fix is likely coming via software update in the near future, but keep in mind that this issue likely spreads to a limited amount of iPhones. Our 8 Plus does not suffer from it. The iPhone beats the Note in the battery game, but for heavy users, it will still be a daily trip to the charger. One area that is resilient to the break-neck pace of phone innovation is battery life. 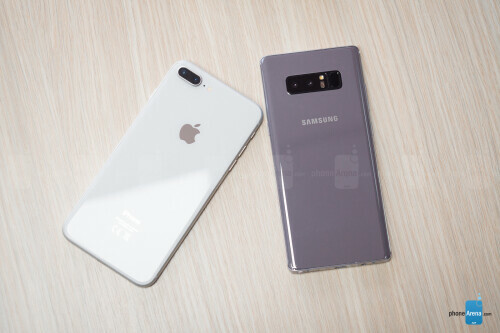 It improves in what seems like baby steps, and the iPhone 8 Plus and Galaxy Note 8 are no exception: both phones will last most users a full day on a single charge, but the most demanding users will need a top-up before the end of the day. Lighter users will be able to squeeze a day and a half, and if you barely use your phone you might get to two days. 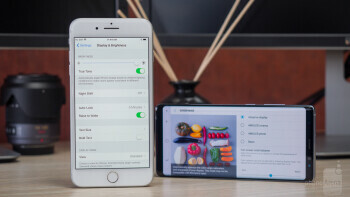 Comparing the two, we find that the iPhone does better in real-life longevity, was it for the great stand-by time or for other reasons, but we did have a better battery experience than with the Note. In terms of battery capacity, there is a 2,675mAh battery on the iPhone 8 Plus and a 3,300mAh cell on the Note 8. Those numbers don’t mean much out of the context of the platform and software, so keep that in mind. The iPhone finally supports fast charging, bringing it on par with most flagship Android phones from the past three years or so. But the iPhone 8 Plus still ships with a slow charger and you need to spend an additional at least $50 for the 29-watt USB-C Apple Power Adapter to actually make use of the fast charging capability. That’s a rip-off in comparison with the free fast chargers that come with most if not all Android phones that support the feature. If you get that larger and more powerful charger, you will get around 40% charge from zero in just thirty minutes. This is especially nice consider the super slow charging speeds of Plus-sized models in the past. Also, the iPhone now finally supports Qi wireless charging, another feature present on many top Android phones in the past years. Wireless charging is slower with most chargers delivers only 7.5 watts of power and is limited in use, but it’s a convenience: you don’t need to worry about plugging in a wire. Apple has its own wireless charging in the works, but it will only come out sometime in 2018 and will likely carry a high price tag, so for the moment you can use third-party wireless chargers like the ones from Belkin and Mophie. The Note 8 also supports wireless charging, but it also has support for the twice as fast Qi 1.2 standard and the wireless charger comes free in a bundle for many users. It doubles as a stand and looks stylish as well. So yes, the 64 gig Note 8 is actually more expensive than a 64GB iPhone 8 Plus with a quite pronounced $130 difference. For all else, it’s a matter of personal preference really. Here are the areas where the two do similarly well: performance (the iPhone has the faster chip, but both feel similarly fast in real life) and camera (in some cases the iPhone takes better pictures, in others – the Note 8 does better). The Note 8, however, excels in places where the iPhone cannot fully deliver. Here is who we recommend the Note 8 to: those convinced that they will use the S Pen (it’s fun and easy to use! 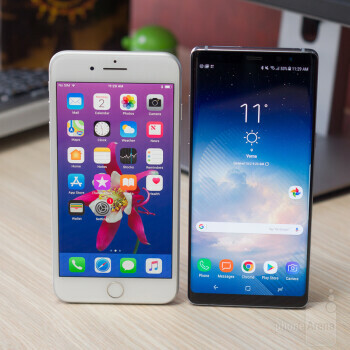 ), those who are bombarded with notifications (it’s easier to deal with them on Android), those who like the options on Android including the faster and easier sharing menus, the split-screen multitasking, the customization options; those who value that vibrant AMOLED screen. But if you think you are the person who: is a video enthusiast (because 4K at 60fps! ), who likes to have their phone just work without dealing with complications, who is a gamer (iOS has better games), who is a heavy iMessage user and / or who is a creative (music and video editing apps are better on iOS) than by any means the iPhone will be a better fit.